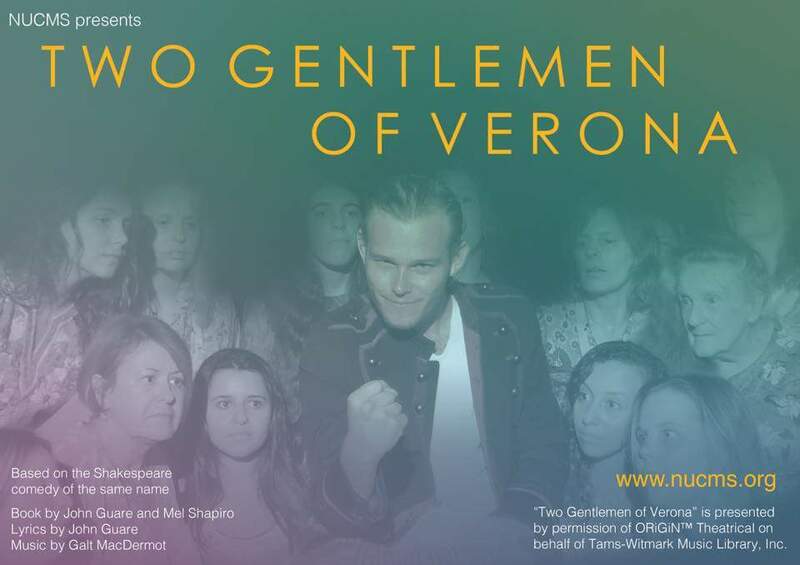 Normanhurst Uniting Church Musical Society put their best foot forward in the Shakespearean jazz-rock musical; “Two Gentlemen of Verona”. The plot takes wild twists and turns and we get pulled along this torrent of comedic miscommunication. Proteus loves Julia, while his best friend Valentino loves Sylvia. A basic premise becomes complicated when Proteus travels to Milan to see Valentino, and falls in love with someone other than his beloved Julia- and thus hilarity ensues. The plot is as predictable as any Shakespearean comedy, but since we’re immersed in the moment, every plot twist is a shock. NUCMS did well to surprise us, directing actors to make use of the audience space and interact with us. With a live band and frantic characters, the actors carried the mayhem with great enthusiasm and energy. Suddenly he’s in love with her, suddenly someone is pregnant, suddenly there’s a betrayal, and all placated by a Greek Chorus-esque ensemble. This musical seems like such fun. The organised chaos gave the production a live excitement. Charmian Fauvet’s performance of Julia was beautiful. Her vocals are so sweet and she glows in the spotlight. Although in a miasma of entanglement, Fauvet presents a love-lorn Julia with such passion. Jessica Knight’s portrayal of Sylvia was fresh and effervescent. With light footed dance numbers and lyric-heavy vocals, Knight played a love-torn damzel with life and colour. The chorus, were like shadows, slipping on and off stage only to propel the plot and play with the characters. Cupid and his helper also had a role to play, meddling with everyone like a puppeteer. This musical was silliness and comedy gold. A fun night out for the family. Red must be poured out. ‘The Imperial Bells of China’ toll throughout The Capitol on their debut Australian tour this May and June. The Hubei Opera Theatre brings to life significant elements of ancient Chinese history, as they focus on the Zhou Dynasty. The show illuminates facets of culture, spirituality, and music, in a showcase of symphonic instrumentals, contemporary dance and folk songs. After the unearthing of stone chime bells from the tomb of Duke Zeng, some 2400 years ago, the Hubei Opera Theatre were inspired to stage the Chime, Music and Dance performance to the world. Their performance was visually spectacular and immersive in a history that lends itself to many of the cultural aspects of China today. As a showcase of talent, the ensemble guided us on a journey through ancient China, from the rural farmlands to the Emperor’s banquets. The performance was broken into chapters that were explained with surtitles for those in the audience who are unfamiliar with the language. It was a truly spectacular display of grandeur and pride. At times, the show slowed its pace to savour the sublime. There were precious moments of grace and elegance through simplicity and softness, accentuated particularly in the detailed costuming and elaborate sets. It really felt as though we were looking through a window into Imperial China, and the view was a real treat. The female dancers performed with long thin feathers for one dance and long silken sleeves for another, sleeves which floated and whirled with the twirl of each lady. The men were more acrobatic, entertaining us with cheeky and physically demanding pieces. Both women and men were light on their feet dancing choreography that was a fusion of traditional instrumental music and contemporary dance. Yet, each performance in the collection told a story. As with many ancient Eastern texts, the stories were poetic, metaphorical perspectives about nature, romance and the transience of life. The soundscape mirrored this as well, in an equally stunning symphony to accompany the visuals. The musicians played traditional folk music that was both regal and nostalgic, and when they isolated each instrument, we were shown how each element could inspire such lyrical poetry. The bianqing, stone glockenspiel-like percussion, emulated the sounds of flowing water through a babbling brook, and the flute was light and energetic like a peacock. I was deeply impressed by the Zither, which was played so effortlessly and without flaw. ‘The Imperial Bells of China; Chime, Music and Dance’ was a showcase of splendour and majesty. A lovely night of culture and history. Something. You try to stay calm. Writer can’t get off the ground. The flight ’til next year.